Falls are the leading cause of injuries for adults over age 65. For senior adults, falling down can result in hip fractures, broken bones and head injuries. A history of falling may also cause your loved one to become too fearful or depressed to maintain an active lifestyle. 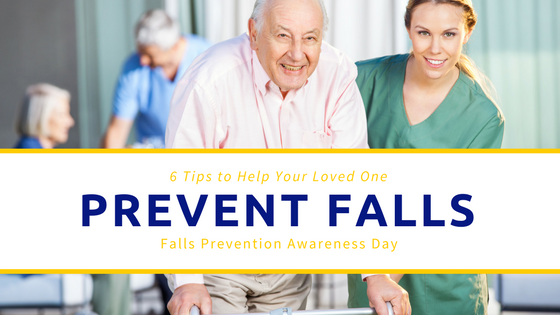 Today is Falls Prevention Awareness Day, set aside to raise awareness about how to prevent fall-related injuries among older adults. Enlist their support in taking simple steps to stay active. Ask your loved ones if they’re concerned about falling. Many older adults recognize that falling is a risk, but they believe it won’t happen to them or they won’t get hurt — even if they’ve already fallen in the past. Encourage your loved one to discuss any concerns about falling, dizziness or balance with their healthcare provider. As about their last eye checkup. Whether or not your loved one wears prescription lenses, older adults should have an annual eye exam to check for changes in vision or signs of other age-related vision problems, such as cataracts. If your loved one wears tint-changing lenses, remind them to use caution when going from bright sun into darkened buildings or homes. Bifocal lenses can also be problematic for some when using stairs. Encourage a conversation with your loved one’s eye doctor to make the most of their eyesight while keeping them safe. Consult a physical therapist. If you notice that your loved one is holding onto walls, furniture or someone else when walking, or if they appear to have difficulty walking or rising from a chair, seek help from a physical therapist. A trained physical therapist can help your older loved one improve balance, strength and gait through exercise. A physical therapist may also suggest a cane or walker — and provide guidance on how to use these aids. Make sure to follow their advice. Poorly fit aids can increase the risk of falling. Do a walk-thru safety inspection of their living space. There are many simple and inexpensive ways to help make a home safer for aging adults, including: increasing lighting throughout the home, securing railings on all stairways and installing grab bars in bathrooms. To learn more about preventing falls, click here. If you believe your loved one is no longer able to live safely in his or her own home, it may be time for a conversation about moving to a senior living facility. The Cottages provide state-of-the-art certified assisted living residences for people living with Alzheimer’s and other memory disorders. Under the direction of our highly qualified, 24-hour staff and access to 7 days-a-week nursing, residents are provided personal care assistance, medications supervision, meals, snacks and specialized activities. Contact us today to learn more.